The Wilmington Blue Rocks are excited to announce the winner of the 17th Annual Holiday Card Contest. Over 1,000 entries were received, but unfortunately, there could be just one winner. After a tough decision process, Rocky Bluewinkle, Mr. Celery, Rubble and the rest of the Holiday Card Contest Committee decided that the overall winner was Izzy Nelson, a 5th Grader from Assumption B.V.M. 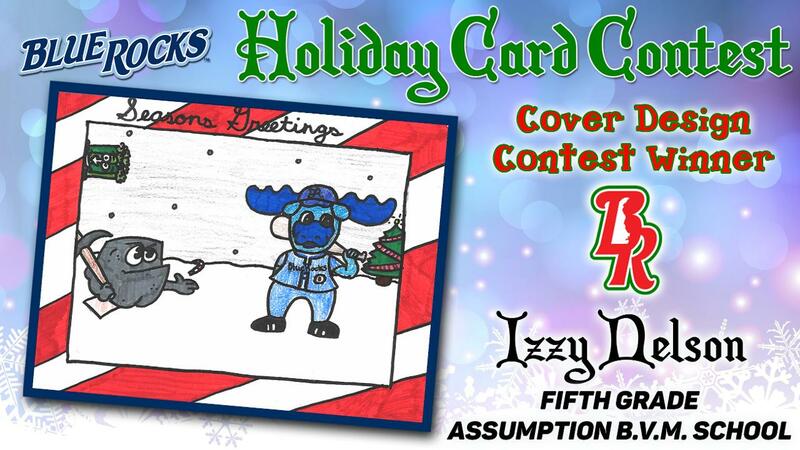 School in West Grove, PA. Izzy's artwork will be featured on the cover of the Wilmington Blue Rocks Holiday Card. Izzy will be rewarded with a ceremonial first pitch and 10 tickets to a 2019 Blue Rocks game. The Wilmington Blue Rocks would like to thank all those who entered. Entries were received from students in Kindergarten thru 5th grade from Delaware, Pennsylvania, Maryland and New Jersey. Each entrant will be rewarded with 2 tickets to a Blue Rocks game in 2019 as a thank you for participating. The tickets will be mailed to the participating teachers by March.